Jelani Cobb with students and faculty members. Photo by Clapp Studios. 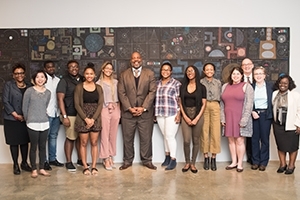 On February 23, students and faculty from AU and surrounding universities came together at the Katzen Arts Center to hear Jelani Cobb speak about race, the history of the civil rights movement, and what he describes as a pattern in US history of racial progress followed by powerful backlash and countermovement. Cobb spoke at AU as part of the Bishop C. C. McCabe lecture series, sponsored by the College of Arts and Sciences. Cobb began his discussion with the trial of Charleston church shooter Dylann Roof, which he covered for The New Yorker. After the trial ended, Cobb flew across the country to San Francisco, hoping to take a break from the heartbreak and tragedy. But the very first person he met in California was a hotel bellman. This man told Cobb that he lost someone dear to him in the church shooting—his childhood librarian, Cynthia Hurd. Though it may seem unbelievable to some people that an atrocity like this could occur in a nation that recently elected (and re-elected) its first African American president, it comes as no surprise to Cobb. Roof was not an aberration, Cobb said, and his actions did not happen in a bubble. Racial progress in the United States has always been followed by waves of backlash, he said, fueled by a culture of paranoia and victimhood by people who feel threatened by it. We only have to look back to the lynchings in the south, he said, and the rise of the KKK during Reconstruction, or the housing segregation in northern cities during the Great Migration. So what do we do now, Cobb asked, and how do we keep moving forward during these difficult times? After all, Cobb said, many heroes in American history were only able to do great things because of the size of the opposition against them. Against all evidence to the contrary, they believed that slavery should end, that women should have the right to vote, that our country can develop a humane immigration policy, that we can create protections for workers.